Fr. Raymond Guiao, SJ, currently serves as president of Saint Ignatius High School in Cleveland, Ohio. Born and raised in the western suburbs of Cleveland, Fr. Guiao was graduated from St. Ignatius High School in 1982 and pursued a B.A. in English at Western Reserve College of Case Western Reserve University. He then entered the Society of Jesus (the Jesuits), was ordained to the priesthood in June 1999, and pronounced final vows in the Society of Jesus in 2009. He served as instructor of theology, English, and music at Saint Ignatius, both as a Jesuit seminarian (1992-1995) and as a newly ordained Jesuit priest (2000-2007). In addition to growing the Choral and Liturgical Music programs at Saint Ignatius High School, Fr. Guiao also served for two years as the interim Vice President for Ignatian Mission at Saint Ignatius. In 2008, Fr. 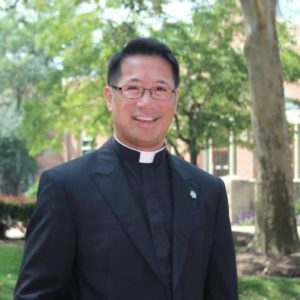 Guiao was missioned to serve as Provincial Assistant for Jesuit Formation for the Chicago-Detroit Province, and was based in the Midwest Jesuit headquarters in Chicago. In December 2014, Fr. Guiao was named the 26th president of Saint Ignatius High School, beginning his duties officially in July 2015. He currently serves on the boards of trustees St. Martin de Porres High School (Cleveland, Ohio) Ohio City Incorporated, and Boys Hope Girls Hope of Cleveland. Fr. Guiao also regularly assists with weekend Masses at St. Angela Merici Church in Fairview Park where his parents, Dr. and Mrs. Ramon T. Guiao, are parishioners, and the Poor Clare Monastery on Rocky River Drive. He is regularly called upon as a spiritual/religious presenter and retreat leader. Fr. Guiao holds a Bachelor of Arts degree in English from Case Western Reserve University (1986); a Bachelor of Arts degree in Music from Mundelein College in Chicago (1988); a Master of Music in Voice Performance from the University of Michigan School of Music (1992); a Master of Divinity from Weston Jesuit School of Theology in Cambridge, Massachusetts (1998); and a Master of Arts in Liturgical Theology from The Catholic Theological Union in Chicago (2000). This entry was posted in past events on April 9, 2018 by suejosecretary.